How Franny’s Conquered BrooklynThe small, family-owned pizzeria embodied the values that would come to define an entire borough. Franny’s, One of Brooklyn’s Most Cherished Restaurants, Will CloseThe pizza destination’s final night of service will be August 20. Franny’s Owners Will Sell Their Brooklyn Bar and Grill, Rose’sThe buyers, however, are the current managers — and they plan to keep things more or less the same. Here Are All of the Pies Competing in Franny’s Annual Pizza BracketSixteen new options compete for a place on the permanent menu. You’ll want to eat all of them. One of Brooklyn’s Favorite Chefs Is Headed to a Meal-Delivery Start-upJohnathan Adler will leave Franny’s at the end of March to take over as the culinary manager of Blue Apron. Renowned Brooklyn Pizzeria Adds 3 Percent Obamacare Surcharge to All ChecksAt Franny’s menu prices will also rise to pay cooks higher wages. In Praise of the Gibson, the Classic Cocktail That’s Finally Getting ItsBartenders are embracing the idea that it’s more than just a martini with an onion. Rose’s, the Franny’s Team’s New Place, Serves Up Burgers andThe menu is short and sweet. The Franny’s Team Will Turn Marco’s Into a Burger JointRose’s will be decidedly more casual. The End of Marco’s, the Best Restaurant That People Didn’t CareWhen a good restaurant just isn’t good enough to get people excited. Franny’s Offshoot Marco’s Will Close Next MonthThe restaurant simply didn’t make enough money. 13 Restaurant Cocktails That Don’t SuckDespite what Pete Wells says, there are many great mixed drinks. Platt: The Glorious Golden Age of LunchSome of New York’s trendiest restaurants are far more enjoyable in the middle of the day. Sara Kramer to Cook at City Grit; Franny’s 10th AnniversaryPlus: Breads Bakery ships nationwide, and more, in today’s Leftovers. Franny’s Introducing 16 New Pies for March MadnessIt’s a popularity contest. Marco’s Will Reopen TomorrowThey fixed the pipe troubles that closed the restaurant last week. Marco’s Closed Because of Plumbing Problems, Hopes to Reopen TomorrowBlame pipe problems on the temporary closure. New Year’s Reprieve: 15 Excellent NYC Restaurants That Won’t ForceIt’s business as usual for Charlie Bird, Franny’s, and ABC Kitchen. Platt: Franny’s Chefs Get Even More Rustico at Marco’sThey’ve expanded, but Brooklyn-style. Party Time: 18 Outstanding New Private-Dining Spaces in New YorkPiora, Franny’s, and American cut have luxurious, secluded spaces. Hearth’s Tenth-Anniversary Dinner Series; New Happy Hours at the ButterflyPlus: a panel with Dana Cowin, and more, in today’s Leftovers. First Look at Marco’s, Now Open in the Old Franny’s SpaceGrub’s got the menu too. Belon Oysters at Louro Tonight; Franny’s Cookbook Signing and Taste TestPlus: City Grit applies pressure, and more, in today’s Leftovers. Marco’s, Opening Next Month, Is Franny’s, All Grown UpIt’s taking over the original Franny’s space. Bottle Service: The Top Wines Under $50 at 16 Buzzy New York RestaurantsAs selected by Rom Toulon, managing partner at Tribeca’s 24 Hubert Wines. The Other Critics: Wells, and Everyone Else, Reviews ABC Cocina; Joshua DavidPlus: Alan Richman on Franny’s, and more, in this week’s roundup. Alan Richman Is Now Writing Weekly Restaurant Reviews for GQHis first one is on Franny’s. 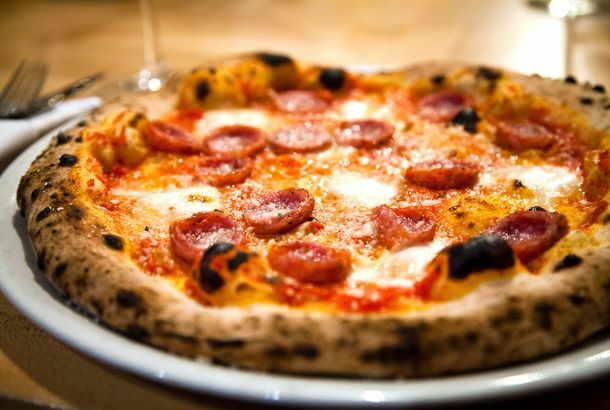 Recipe Rumble: Franny’s Versus MozzaWhich restaurant’s cookbook turns out the best pizza? Franny’s Now Open for Lunch Every DayThe whole menu is available during lunch hours. The Pass: Where to Find Spring Asparagus This WeekendIt’s that time of year again. Franny’s Goes Large-Format: New Location Will Nearly Double SeatingPizza freaks, brace yourselves. Only 13 More Days Remain at the Original Franny’s in BrooklynFranny’s 2.0 may be open as soon as April 8. Franny’s 2.0 To Open in November, Original Franny’s To BecomeThe beloved Brooklyn Italian restaurant is expanding. Franny’s Was Supposed to Be in Egremont, Massachusetts — Until theSo says a new digital food magazine. Platt at Vandaag and Takashi; Time to Get the TurkeyPlus: a slew of new openings including Kin Shop, Bar Basque, and Ciano. Feast for a Good Cause: Teaching Children to Eat (and Grow) Their VegetablesUpcoming events at Edible Schoolyard, the Union Square Greenmarket, and the Stone Barns Center plan to do good for kids. User Reviews: Franny’s Is ‘Festive,’ La Esquina’s TacosPlus: Celeste’s incomprehensible cheese narrative, and deathly good pulled pork at Blue Smoke. Spotted Pig Brooklyn? Not a ChanceManhattan restaurateurs consider Brooklyn while Brooklyn proprietors ponder Gotham. 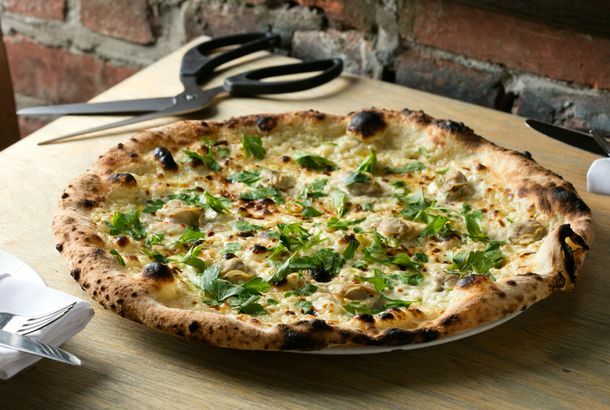 Pizza Slices: Movies at Co., Rumblings at Totonno’s, and the Best Pie in’Rachael Ray’ enlists a couple of experts to find the best slice in the USA.